Justice League Dark is a superhero book driven by horror storytelling, so it makes sense that it would be at the center of an event during the spookiest month of the year. Wonder Woman & Justice League Dark: The Witching Hour is a weekly storyline unfolding in two 48-page one-shots and this month’s issues of Wonder Woman and Justice League Dark, pitting Wonder Woman against her new team when mystical trauma from her past incites a villainous turn in the present. 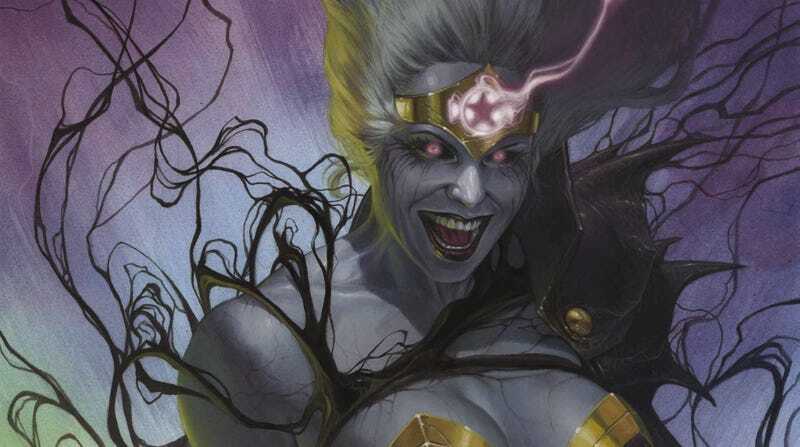 All parts are written by Justice League Dark’s James Tynion IV, who introduces new aspects of Diana’s history that reinforce her connection to the terrifying elements of this superhero universe. This story also serves as a bridge between two Wonder Woman creative teams, giving Tynion IV the opportunity to tell a bigger story while he fills in for the month. This exclusive preview of this week’s Wonder Woman & Justice League Dark: The Witching Hour #1 delves into a terrifying event in Diana’s past, when she was hunted by worshippers of the witch goddess Hecate in the forests of Themyscia. Artist Jesus Merino and colorist Romulo Fajardo Jr. worked together on a few issues of James Robinson’s recent Wonder Woman run, and Fajardo Jr.’s crisp, textured coloring is a great fit for the meticulous detail of Merino’s linework. They get to show off their horror skills with the opening scene of Diana being chased through the forest, creating a sense of isolation as Diana is hunted by creatures shrouded in darkness. The close-up splash page of Diana being branded accentuates the pain and fear of that moment, and the upside-down composition adds an element of disorientation that works especially well for the genre.